Take part in Wolverine’s blockbuster weekend with Wolverine: Japan’s Most Wanted #3, the latest chapter in a 13-part Infinite Comics epic on-sale now! Suit up with superstar creators Jason Aaron, Jason Latour and Paco Diaz as they take Wolverine on an adventure like you’ve never experienced before! Stranded in the far reaches of Japan, Wolverine must slice his way not only through the deadly Silver Samurai, but the entire Tokyo police force. Yet even when he’s outmanned, outgunned, and on the run, Wolverine is still the best there is at what he does—but he’s not the only one. 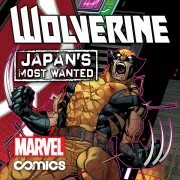 With the endless possibilities of the digital canvas, Wolverine: Japan’s Most Wanted #3 is the best there is at what Infinite Comics can offer!